Being from South of India, Sambar is almost a staple for us at home. 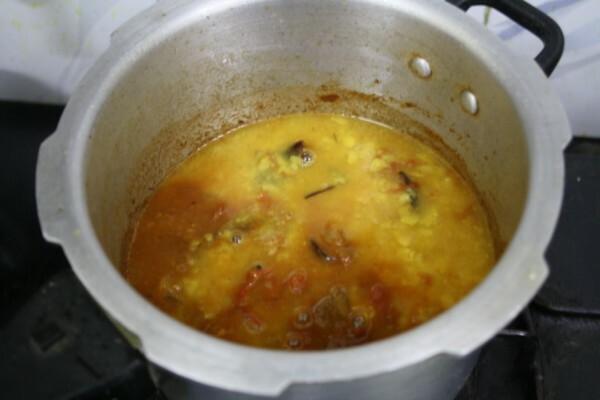 Though in Andhra sambhar is not supposed to be a native dish. Yet these days it’s quite common to hear it being prepared frequently. But when you talk about Tamil Nadu and the way Sambar is made, well it’s inevitable that there are many ways to make this simple dish. Even though I make Sambar almost twice or thrice at times a week, I was still tempted to learn the way this sambar was made by my colleague’s mom. They hail from Tirunelveli, and this is the way they make their sambar. I am sure even this might vary from other families from the same city. Tirunelveli is famous for its Tirunelveli Halwa. I was happy knowing another delicacy from the place. When I finally made it at home, I did forget some and by practice added some. Like my friend said they normally don’t add tomatoes. But then I got it confirmed from her mom that tomato can be added. Well it’s all what’s available at hand finally I guess. Still this had lots of different steps involved. It tasted great with steaming Rice. I took this for my lunch and had fun. 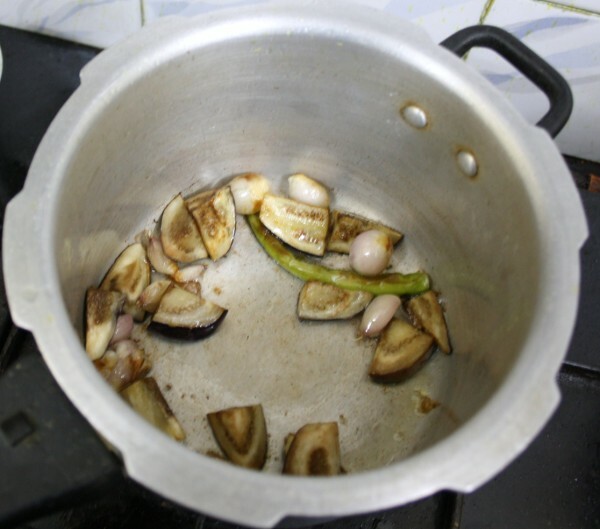 Heat a pan with oil, saute shallot onions, Brinjal pieces, Green chilies till they turn light brown. Meanwhile, stir the mashed tomatoes, add red chili powder, Coriander powder. 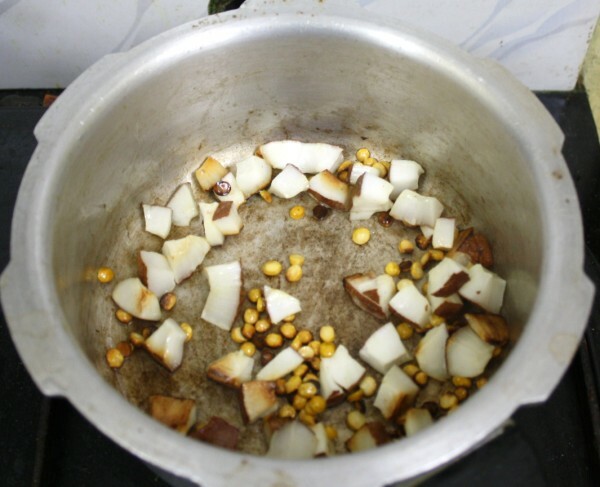 Add cooked toor dal to the pan, add required amount of water. Make a smooth paste with the roasted ingredients. Add to the boiling dal. Finally season it with curry leaves, methi seeds, Hing, Urad dal and mustard seeds. Pressure cook Toor dal with twice its amount of water til soft. Keep it aside. In a bowl soak Tamarind and extract the pulp from it. If you want you can mix the red chili powder, coriander powder and salt in this water and keep it aside. I normally prefer to add to the dal directly. In a separate pan, add 1 tsp oil, roast chopped Coconut, Cumin seeds, Small Onions and little Bengal gram. 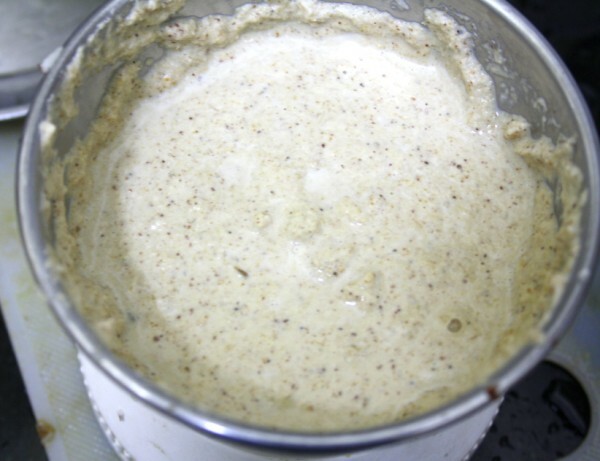 Allow it to Cool and grind to a smooth paste using water. This can be added raw but I wanted the roasted aroma of the coconut. 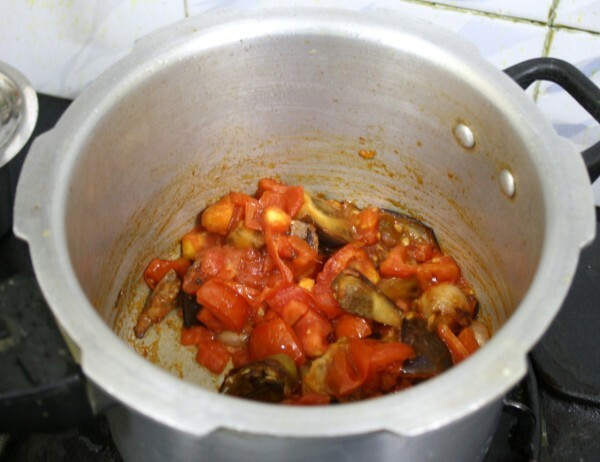 In a pan, add shallot onions, brinjal pieces and green chilies. Sauté well. Then add chopped tomatoes and fry till it’s soft. Then add the Red chili powder, Coriander powder, tamarind extract and salt. Simmer for 5 mins for everything to get cooked well. Then add the cooked dal, bring to boil. Then add the ground paste required water to get required consistency. Finally season by heat a pan with oil, add a pinch of hing, Curry leaves, methi seeds, Urad dal, mustard seeds. Pour this over the boiling dal. Enjoy with Steaming Rice and vegetables. Different vegetables like Radish, Drumstick can be used. You can make instant spice powder by roasting Dry Red chili, Coriander Seeds and Bengal Gram and powdering it to be added directly. Tomatoes can be avoided if you want. Yummy! I can get the fragrance till here 😉 It looks really good,Sri. This must have tasted great with rice and chappatis. 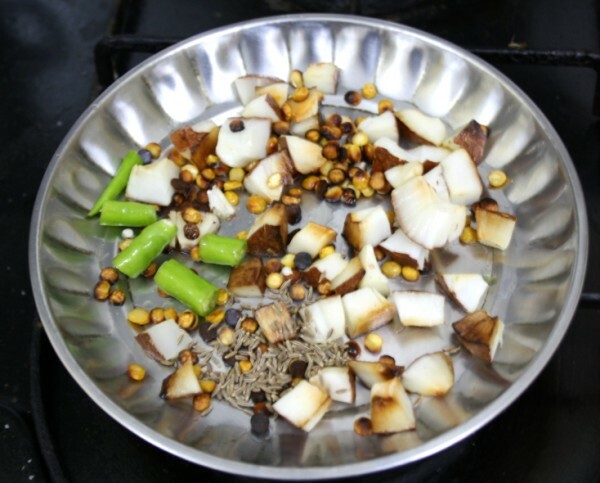 Lots of little steps to get a perfect sambhar!! Reminds me of the sambhar we have at my paati s place. 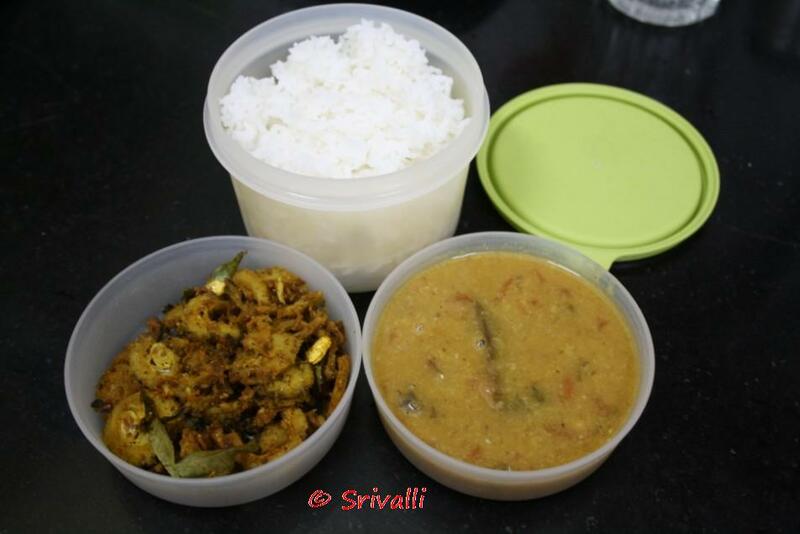 We make sambhar like this on Pongal with all the vegetables that are offered to the Sun God. We call is " KOLAKARI" meaning a mixture of all vegetables. I am always intrigued by recipes for sambhar..each recipe is different yet similar from each other! This looks different from our sambar,we dont add coconuts to sambar. I have also seen them adding jaggery in some parts of Tamil nadu. just wondering how different it is from the tanjore/madurai tamil style sambhar. Got to try it to know the difference. Makes a good addition to the variety while serving. Thanks for the recipe Valli. Am all set to try this! Sambhar can be made in different ways I guess. In Karnataka it is called Huli and We love it. I will try this way and I am sure we will enjoy it with rice or idli. Thanks for sharing. Looks like aracha vitta sambar, simply inviting.. I am sure that you have loads of patience.. 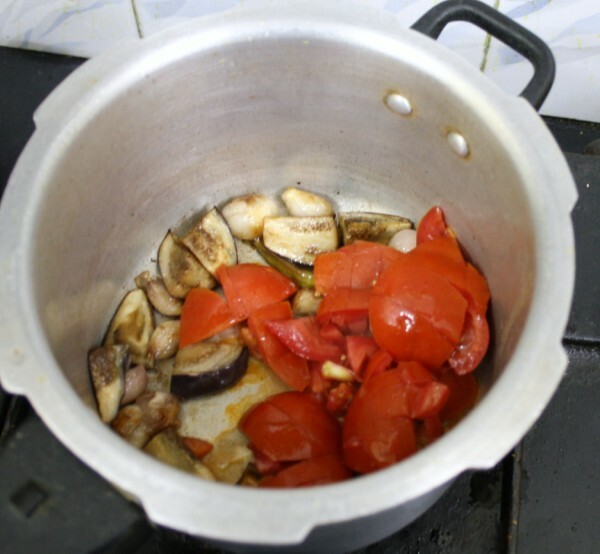 I can feel the aroma of the roasted ingredients and the sambar… wow.. Different one Srivalli. Just wanted to tell you about cooking acidic ingredients in aluminum pan. 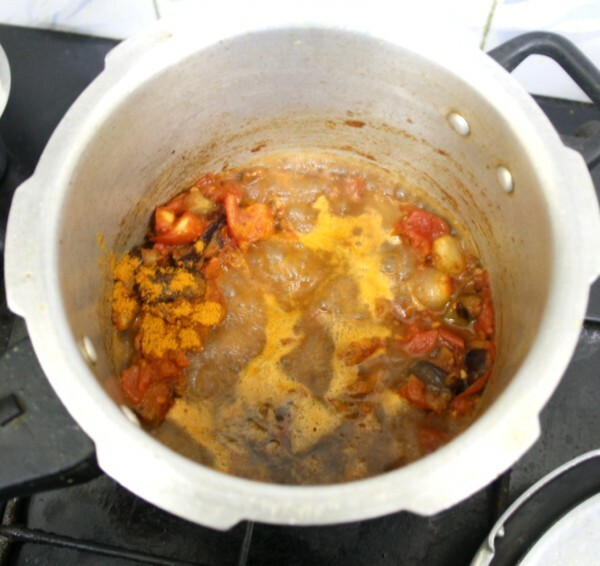 Aluminum reacts with tamarind, tomato and other acidic ingredients mixing with the food. They suggest not to cook those in the aluminum pan. Just passing on the info. Sambar looks so delicious !! 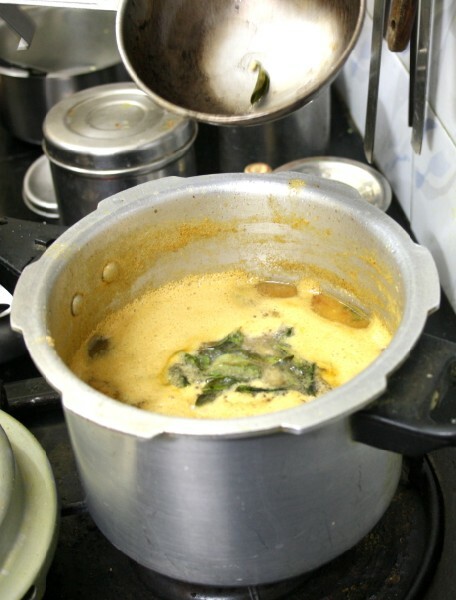 the addition of locally grwon vegetables gives a unique flavour to sambhar. thank u for the nice post. Champa Thanks for the information. I did read on this and understand that only storing the cooked food that has tamarind in an aluminum vessel is more hazardous to health. I guess cooking dissolves very permissible amount of aluminum. Still will check around how to avoid this..
love the sambars and step by step pics are really helpful. That lunch box makes me hungry. Lovely presentation,the sambhar look delicious, Valli! This is called arachuvittha sambar na? have heared about it from friends,and wanted to try it for a long time.will surely try this recipe…i'm bookmarking it…step by step pic is very usefull..
http://www.sharemyrecipe.blogspot.com is my blog.drop by when you get time.. Though i have hit many websites for step by step recipe methods but to no avail and luckily today i landed in this website. Though im yet to try cooking this receipe, iam confident of doing this sambar easily as it has been wonderfully explained step by step visually besides in words. For the first time cook like me such elaborate detailing would be of much help in trying out the receipe. Thanks for such a first step by step method explanation. i humbly suggest your receipe service could be even directed at first time cooks with further depth in detailing. 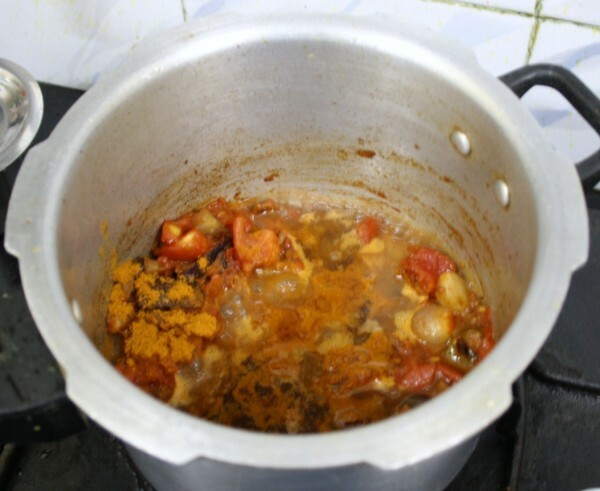 Oh I am surprised that it turned out as a pulikolambu..the tamarind proportion I have mentioned, is not too much for the Toor dal I have used..so wonder what happened..anyway hope you had a good pulikolambu..:)..do try again and let me know.